This chime is tuned to the opening notes of La Marseillaise, France's national anthem. Originally called "War Song for the Rhine Army," La Marseillaise was a revolutionary song with a call for patriotism and freedom from tyranny. 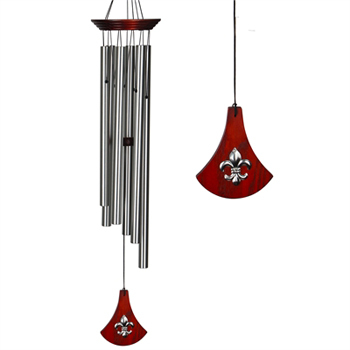 The fleur de lis on the chime's windcatcher is a symbol often used by French royalty. The fleur de lis, or "Lily Flower," appeared on the flags and clothing of French monarchs and can be seen on monuments throughout the country. It also has been a symbol of New Orleans since its inception and is the logo for the New Orleans Saints. May the gentle chiming of our Fleur de Lis Chime transport your customers to the banks of the Seine, the French Quarter, or wherever their hearts may roam.